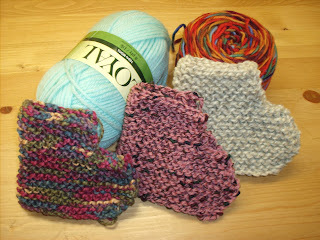 Follow the link to see the photos of our felted projects. The before and after clog picture didn't make the cut but it was a real eye-opener. More pics will follow when our class finishes their multi-coloured felted clogs. 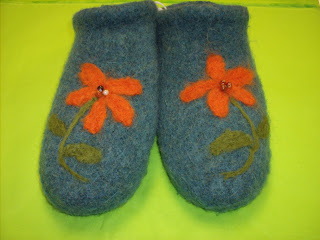 We are all set for our first Felting clog class tonight. Donna has been busy getting the clogs started and left in various stages for the class to see them transform into felted wonders. www.mycollingwood.ca stopped by for a photo shoot for our felted examples. now even Julie wants to take the class. Look at all the really fun pieces we've made. Felting can be so much fun. 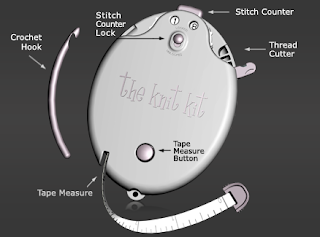 Who really knows how much your project will felt as from time to time your yarn while you might be using the same yarn, the project and knitting stitches will dictate the final outcome. So, we're off to class. Catch you later. It's the last of our Trollbeads sales. We are clearing out all remaining stock. Purchase one bead at regular price and receive your second bead FREE!! SALE starts Wednesday April 28th @ 10am and continues until Saturday May 8th. 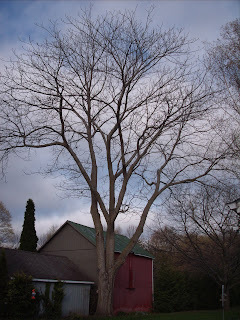 A couple of years ago I contacted the ministry to ask about the Butternut tree endangered program. Madelaine D showed up to check out out 80+year old shade tree. She was amazed at how healthy the tree was and GPS'd it right away. We have been saving tree fruit every year for the MNR to pick up. We had great news that our Butternut babies were identified and 100% pure DNA tested Butternut!!... yahoo... Several of our fruit seeds have grown and been replanted @ the Angus tree farm. :), the Sommerville Tree farm in Alliston and a few other tree farms. Criticism can be constructive or down right uncalled for. Today was an overload of misplaced critiques. It's the old "damned if you do... and dammed if you don't... I will always try to be objective and look at both sides of the comments and situations. Walking in my shoes for one week would explain to you first hand what it's like to be in my business. 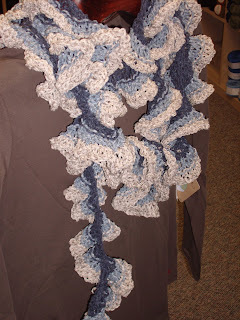 It is always fun to see a before and after felting project. We will take a few pictures along the way. Both classes require preregistration- There will be a Wednesday night Part 1 class starting Wednesday April 28th from 7:00pm to 8:30pm. The part 2 class is the following Wednesday night May 5th. A Saturday morning class will be offered at a later date. We chatted about Joanne's time in Florida- her Monday knit group @ Starbucks- sign me up!!! She golfed, shopped, visited wool shops, visited with family- a general fab time!! We then compared our latest & greatest knitting projects- Joanne with the gorgeous little silk lacy scarf, her beautiful multi textured shawl and some lovely new mohair for her sweater. PF Flyers: Radio Flyer: Clam Diggers...?? Well, it was sure funny this morning on Canada AM. Jeff seemed to be the only one who knew what PF Flyers, Radio Flyer and Clam diggers were. Here's my latest news... 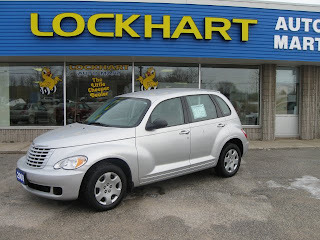 I am now the proud owner of a PT Cruiser... oh ya!! 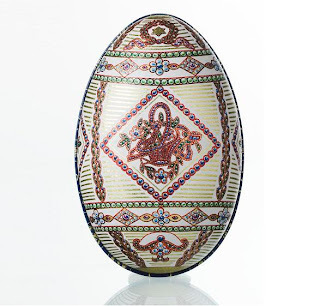 Every Easter since moving home from Denmark I lament about the fact that I won't make my annual trip to Illum's candy department for my Faberge Easter eggs. As you read in an earlier post, my wish came true!! 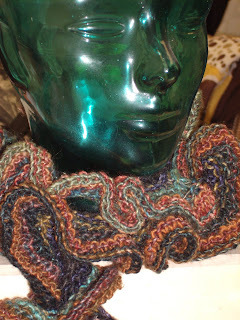 I have made this lovely little Silk ruffle scarf in Noro for Akiko as a thank you for sending me my Easter treats!! Notice the green glass display head- My friend Janet gave me four glass "hat heads" as I call them. They were Jan's Mother-in-law, Vi's. Vi passed away this week at 94. She had a marvelous collection of hats. She was a hat girl!!... Her front closet had a top shelf of hat heads dressed with HATS!! I will treasure these glass hat heads. Thanks Jan, for such a lovely thoughtful gift. Driving to work in the Georgian Bay area can be a real adventure. This morning was no exception. An anxious group of wild turkeys were venturing out to cross highway 26 in rush hour. foolish girls!! Pretty soon the local apple blossoms will be popping open. Our valley orchards will be full of bees excited to get the first taste of blossom juice. I'm glad the sun is shining today. It's a tad cool but soon the warmer temps will be back. When the snow leaves the anxious gardener in me emerges. A small selection of daffs & tulips are peeking out in the front garden. Our little blue bells and snow drops still cover our front grass. I hope they stay around a little longer. The trees are budding, the robins are nest building and Morley is back to chasing the squirrels. Well it's spring time for sure. The robins are racing around busy making nests and we're sorting out our newest patterns deciding which one to make first. If you see a pattern and just have to have it- drop me an email and we will ordered it if we don't already have it..
Every girl should have one... don't you think? This is a really exciting event. Dozens of artists submit their 12"x12" canvas to participate in the show. The doors open on Friday April 9th @ 6:00pm. Everyone sees the show all at the same time. There is no advance viewings. I was so excited today when my husband showed up at my shop with a small package under his arm. I could see that it came from Denmark and that had me puzzled.... what could this be?? It was my favorite chocolates Michelsen in the Faberge egg. oh ya!! Our friend Akiko lives in Sweden.